1 1/8 x 7/8-inch Sterling Silver 4-Way Medal. Comes as a ready-to-wear package with a 24 inch silver chain and a premium keepsake jewelry box. This amazing collection features ten of the most beloved Bible stories on DVD, produced with high-quality animation that will deeply engage and inspire children of all ages. Each film is about 25 minutes, making a total of 265 minutes of pure Christian entertainment and inspiration. Rated G.
The Blessing Bracelet for Him is sized larger than our other bracelets. Hand woven in Medjugorje, Bosnia and Herzegovina this bracelet features 10 silver dipped Benedictine medals and our signature “blessed” tag. Each bracelet comes on a card telling the story of Medjugorje and the powerful protection of the Benedictine medal. Medals made in Italy. This bracelet comes on cording with a sliding slipknot for an easy fit. Measures 11″ when fully opened. Depicts both the image of St. Benedict and the Benedictine Cross. Medals Approx. 1/3". 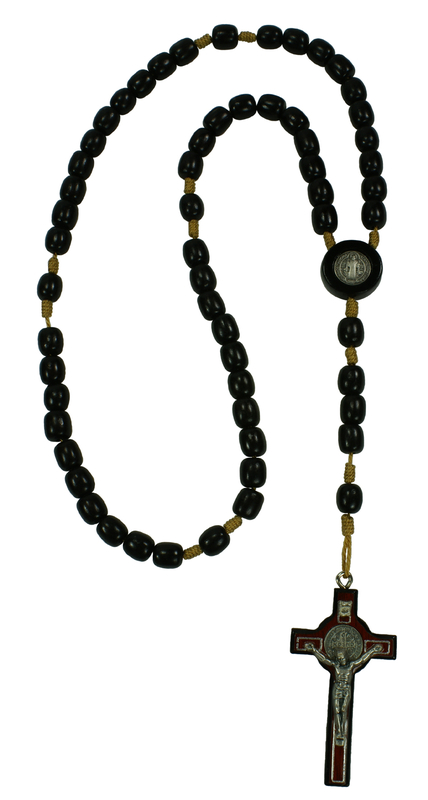 This St. Benedict Black Wood Rosary & Pouch has passed our quality control assessment and meets our strict criteria to be a Catholic Shop product. Buy with confidence.